Haraki is a charming small fishing village located on the East coast of Rhodes. The half moon bay with a pebbled beach has a great selection of tavernas, restaurants and bars on the seafront. From the top of the Castle Hill enjoy amazing views of the village. 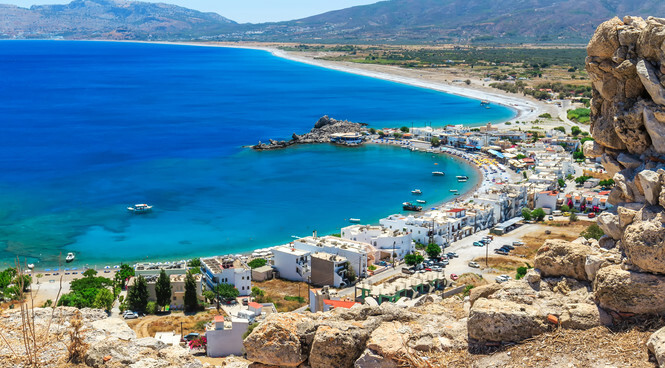 The sandy beach of Agathi and the delightful village of Lindos are just a 15 minute drive away.Haraki is a charming small fishing village located on the East coast of Rhodes. The half moon bay with a pebbled beach has a great selection of tavernas, restaurants and bars on the seafront. From the top of the Castle Hill enjoy amazing views of the village. The sandy beach of Agathi and the delightful village of Lindos are just a 15 minute drive away. In Haraki you’ll find a couple of mini markets and souvenir shops. Fresh bread is available daily from a bakery along the main road. Just a short drive away is the ceramic factory where you can witness traditional Greek pottery being made and perhaps purchase some of the items to take home. Try different olive oils from the factory and browse the various different products made from the plant here. In the nearby village of Massari there is a butchers, bakers and mini markets. The main supermarket is in Kalathos, a 10 minute drive south. A great selection of bars and restaurants can be found along the sea front promenade and scattered around resort. Traditional Greek cuisine and outstanding fresh seafood are particularly popular dishes served in Haraki. More choice of Greek and international cuisine is available in the larger resorts of Lindos, Pefkos or Lardos, all easily accessible from Haraki. Beach lovers are well catered for with Haraki beach, a calm pebble beach with clear waters, ideal for snorkelling and couples who want to relax and unwind on holiday. Just north of Haraki is Agathi Beach, with soft sand and shallow warm waters – a firm family favourite. For more excitement partake in the plethora of water sports activities on offer at Tsambika Beach or handglide across the bay from the headland! The East Coast of Rhodes is famous for its marine life. Snorkel off Haraki Bay and you’ll be sure to find a wealth of interesting and exotic marine life. Explore this spectacular coastline further by hiring a boat from Haraki Bay and discover some hidden bays. Jump on an organised fishing trip and spend an afternoon reeling in your fresh catch to enjoy for dinner later. The Faliraki Waterpark, on of the largest in Europe is about 45 minutes’ drive away. The ruins of Feraklos Castle looks down over Haraki bay. The castle was used by pirates before the knights of St. John ousted them then reinforced the castle and used it for a prison. Now with a charm of its own, watch it light up at night, a fabulous feature to admire in the warm summer evenings. Visit nearby Lindos, once a fishing village now a popular holiday destination. Explore the narrow, paved streets amongst the white washed houses and climb the hill to visit the Acropolis and admire the amazing views.